One of my very favourite of the online women’s cycling fans is Peter van der Veen, who I’m sure a lot of you know from his twitter, and from all the work he does over on Cycling Fever. Here he explains the qualification system for the women’s road cycling in Rio 2016. You might have heard riders and media talking about 2015 being a pre-Olympic year and thus very important in preparation for the Olympic Games in Rio de Janeiro in 2016. But whereas it for some riders it is more a matter of having a good season and a forming a good basis for the Olympics most other riders are more concerned with getting there in the first place! As you might know there will be a Individual Time Trial and a Road Race in Rio. Qualification goes by nation meaning a nation gets a spot and can select the rider they want. So Linda Villumsen who is the current world champ ITT can miss the Olympics if New Zealand selectors decide not to select her. This can be convenient in case of injuries so they can appoint a different rider or in a situation like Marianne Vos who currently does not contribute to The Netherlands spot on the ranking but can get a spot on the road team in favour of one of the riders who scored a lot of points, say Kirsten Wild. The qualification rules for Rio are at times difficult to understand but even more difficult is see where a nation or rider is in the qualification process. First I will focus on the rules. Every ITT rider also needs to ride the RR or at least be on the startlist, and this can be problematic for certain nations, but more on that later. Now you ask what about nations qualified under 3? Those spots will be deducted from best 22 nations starting at ranked 22 going up taking one spot from each nation. Complicated? Not really – I will give an example in a minute with the current qualification ranking but this is where things get complicated because that ranking starting on 1 June 2015 and runs to 31 May 2016 and the UCI is not providing us a ranking with that start date. Instead it only gives us the year ranking which also has the UCI points of early 2015 which don’t count for qualifying. To help federations, riders and us fans I tried to make a ranking that only has UCI points in it which count for the qualification for Rio. However I did this manually and I can’t guarantee it is 100% correct. You will see unsurprisingly Netherlands tops the ranking and can send 4 riders just like every other team down to Belgium. Nations from Great Britain to South Africa can send 3 and the others 2. You see Brazil mentioned as 24th, so they now need to make use of their right as the host country to get their 2 spots in the road race. If, however, they had scored another 20 points Slovenia would have been 23th but would still be entitled to 2 spots as the host country spots become available to other nations. Since the continental champs have not been ridden I shall ignore rule 2 for now. Now If I look at the UCI ranking per rider, I also have I see that Martina Ritter from Austria (49th), Amalie Dideriksen from Denmark (67th), Mayuko Hagiwara from Japan (72th), Milagro Mena from Costa Rica (76th), Davia Tuslaite of Lithuania (86th), Marlies Mejias Garcia of Cuba (95th) and Olena Pavlukhina of Azerbaijan (98th) are all in top 100. This means 7 nations have a right on a spot. 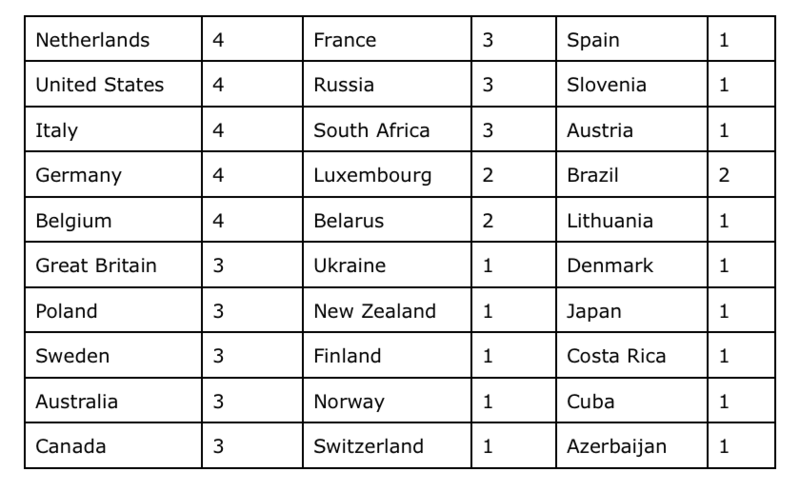 Thus if the UCI had to hand out spots based on my ranking these nations would get a starting rights. Note that Brazil can’t have their number of spots deducted below 2 as host nation. Now some of you might have noticed the gap between Italy and Germany is very small, while Italy have a lot of good riders and Germany only a few. In the UCI Nations Ranking the UCI points of the 5 best scoring riders of a nation are added to the nation total score. This helps nations like Belgium, Great Britain and South Africa who all depend on a few good riders, while a nation like Australia gets punished in a way for having many sub top riders, but none of them really standing out. Example: Carlee Taylor has 66 points as 6th best rider of Australia, Sweden’s 6th rider Sara Penton only has 2 points. If they counted all points from all riders Australia would have easily been top 5 and thus have an extra spot for the road race. Another example is if Thalita De Jong, the 6th rider of The Netherlands who has 179 points would change her nationality to, say, Icelandic, she would not only get Iceland one spot as she is among the 100 best riders but Iceland could also can send 1 extra rider because they would be among the best 22 nations! For the ITT, the first 10 spots could been earned in the last Worlds Championship in Richmond by finishing within the best 10 nations. Thus in Richmond New Zealand, The Netherlands, Germany, Australia, United States, Belarus, Belgium, Russia, Czech Republic & Canada secured at least one spot in the Olympic ITT. The remaining 15 spots for the ITT will be distributed according to the UCI Ranking by Nations, so Netherland to Belarus. However, as said earlier, these nations need to qualify first for the road race, and for the Czech Republic that is an issue. Sablikova rode her nation among the best 10 nations at worlds on the clean ranking but has not gathered enough points to get the Czechs among the best 22 nations, nor did she or a countrywomen gain enough points to be among the best 100 riders. The ITT will then start with 24 instead of the maximum of 25 riders. The final thing to consider when distributing the Olympic starting rights is what if a nation does not want to fill (all) their spots? If a nation qualified through rule 1 or 2, these spots will go to nations in the top 10 best nations of the Worlds ITT (in the current situation, the Czech Republic). If they qualified through rule 3 they will go to nations who lost places because of the Individual ranking (in the current situation, Ukraine). If any spots remain unused after this a committee will decide where those spots go. So far for the qualification system, what does a rider actually have to do to get their nation on the Olympics? For individual riders to get in the top 100, only 60 UCI points would be sufficient, but the extra races in the (pre-)Olympic year means you most likely need 100 or even a few more points to be in the top 100. Ritter, who is now 49th has 102 points, which might just be enough but for those other 6 names I named earlier they need to score some more points to qualify for the road race in Rio. For nations wanting to be with the best 22 (2 RR places), I expect they need around 275 UCI points to qualify. For the best 15 (ITT spot) 400+ UCI points, best 13 (3 RR places) 550 and for top 5 (4 RR places) 1500. These number are my own predictions based on past years. The current ranking has small bias because all the spring races are not included yet, but the spring races are not the most important races. Also the pre-season races in Argentina and Australia and races in Thailand, Mexico and most importantly China have a lot of points up for grabs. The current ranking has a negative bias for Australia and they might Belgium (or rather D’hoore) for that 5th spots. Australia always scores a fair number of points in the winter and spring because racing starts there earlier and not only will they score points in January and February, they will take that form to Europe will Europeans might not be that far in their build up. Chongming will be very interesting for qualification too this year. The Asian nations (China) might have shot themselves in the foot with The Tour of Chongming Island in the new Women World Tour. The WWT could mean that teams like Rabobank and Boels will be going to China, leaving less points for the smaller nations. France often scored many points there with Fournier and Jeuland but for the Chinese it is basically their only chance to get a spot for the road race as races in East Asia are very rare. The races in Thailand, Mexico, Venezuela (4 races!) will be important for the bottom part of ranking and the individual ranking. Thailand will too isolated to make a big impact as only racing Thailand won’t give enough points. The races in Venezuela can get someone to make her way up to the best 100 riders or with a combined effort a nation with the best 22 nations. One final remark in the end: it does not really matter if a nation is 22nd or 19th in the ranking as they will both end up with 1 spot due to the deduction from the individual ranking. In that respect it might not even make much of a difference how a nation qualifies in the bottom ranks unless you depend on strength by numbers rather than one person for scoring the points. It bothers me SO much. Especially the prioritisation of more countries over top riders. Peter’s point about De Jong swapping to (eg) Iceland just highlights how ridiculous it is. Given that currently (April 10) 80 points are enough to enter the top 100 in the individual rankings and earn a spot at the Olympics, do you still estimate that 100 points will be necessary by the end of May to stay in the top 100, or will 85 or 90 suffice?